Taken from The Scrumptious Collection Volume 1: Simple and effective, this shawl has a delicate central lace panel and garter stitch outer panels. 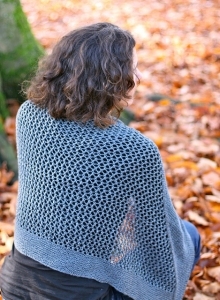 Worked from the bottom up, optional beads are added to the lace central panel They add weight and sparkle to the shawl. Size US 7 - 47" circular (or size needed to obtain gauge) are required but not included. Finished Measurements: 41.75" wide 21.5 " deep after blocking. $56.80 -- Kit price including yarn only (no book or pattern).